In today’s low growth and distracted world, business presentations offer a rare opportunity for your executives to inspire and persuade a captive audience – and impact the success of your organisation. 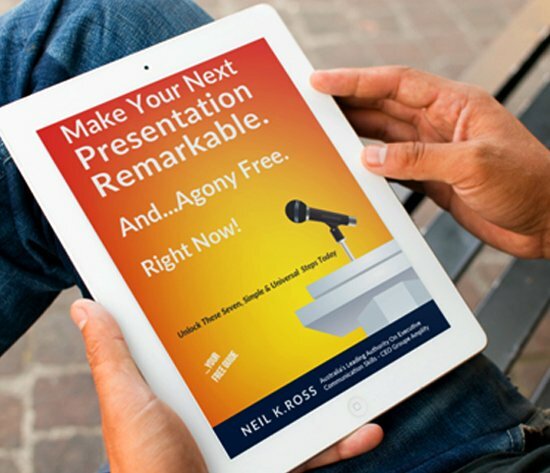 Be it a new business pitch, a team meeting or a major event, a well-crafted and delivered presentation can boost morale, sales, profits and your brand’s reputation. Just as powerful and compelling presentations can lift business, profits and optimism, a weak one can be detrimental to the presenter and your organisation. So, this Master-Class in presentation strategy and communication techniques teaches executives how to plan, create and deliver content with greater impact, influence and persuasion. Situations where the presenter needs buy-in and acceptance for what they are proposing e.g. new business pitches, management approval of proposals etc.